Nothing to do with caricatures - Sunday I spent the day at the RAAF Pearce Air show just North of Perth. I'm a bit of an Aircraft geek, having grown up living on airbases. My late father was a career RAF man. Beautiful weather, clear skies and lots of noise ! I went to the 2005 show ( this was far better ) but spent the day watching through my camera lense. 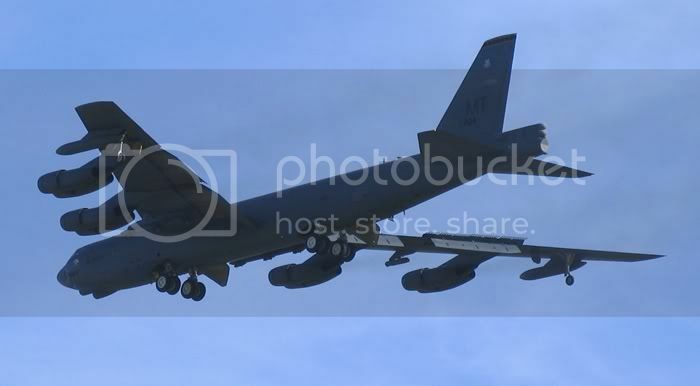 Only took one worthwhile shot this year, B52 flypast, decided to just enjoy the noise and awe ! Traffic was a nightmare getting to and from the event - but I'll be back there for the next one. I really must get to the big bi annual show in Avalon, Victoria. Here's a snippet of the day's events from the local Channel nine news.